Jr Accountant and TRA exam date is change and new exam date is 4th October 2016. Download RPSC Admit Card on official website after 20th September 2016. 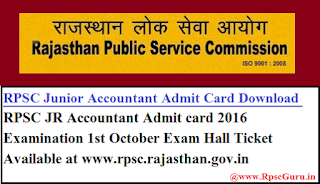 RPSC Junior Accountant Admit Card: Rajasthan Public Service Commission RPSC is going to conduct the Junior Accountant and Tehsil Revenue Accountant (TRA) Examination 2016 on 4th October 2016 . Previously this examination is held on 2nd August 2016 but some of reasons The Rajasthan High Court is canceled the exam, Now, aspirants those who has applied in the examination and are going to present in the re examination are first suggested to download the Junior Accountant Re Examination October Hall Ticket 2016 from the official website given below from 15th September 2016. The examination is going to held on various examinations centers across Rajasthan. Download rpsc admit card is available on official website of the board. 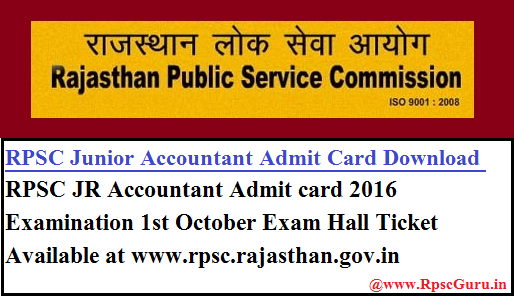 Rajasthan Public Service Commission, Ajmer is going to organize the Junior Accountant and TRA OMR Based Based Exam whose dates are 4th October 2016 (OMR Based Exam) as on two shifts on a day respectively. The examination will be organized by the various examinations centers across in Rajasthan. The junior accountant exam is conduct two shifts, First shift is 1st paper and Second shift is to Second Paper. RPSC is going to conduct junior accountant re examination 2016 as on 4th October 2016. Thousands of aspirants are appeared in the examination by online mode. Junior Accountant and TRA new exam Admit Card/ Hall Ticket is ready to be download on Rpsc Online Website. Aspirants, this is good news who are waiting for RPSC Junior Accountant new Syllabus exam. Rajasthan Public Service Board is now announced new exam date as on 4th October 2016. You can also download RPSC JR Accountant new syllabus and Study Material for Jr Accountant keep visiting this website for latest updates. Click here to download official notification. How to download the JR Accountant Admit card 2016? First, candidates are suggested to visit the official website of the board. Click Admit Card 2016 link or Click Here. Enter your details like as Application ID,Date of Birth and Exam Name. Then, click on the Process option. Now, you will see your hall ticket for junior accountant 2016 that will be displayed on your screen. Click on ‘Save’ to download option and take a ‘Print’ to get the hard copy of your Hall Ticket 2016 for future use. Paste your recently passport size photograph on your hall ticket. Readers we will update Junior Accountant Answer Key on same day of examination. Keep following with us for download RPSC JR Accountant Answer Key 2016. Study Material for Junior Accountant and TRA exam.